Along the southwestern coast of Cyprus lies Paphos, identified in mythology as the birthplace of the Greek goddess Aphrodite. Right by the sea and backed by the Western Troodos Mountains, it is a scenic as well as historic area. In ancient times, Paphos was the capital of Cyprus, and its archaeological museum showcases a number of artefacts from its glorious past. Especially renowned are the ruins of the Roman Governor’s palace with their exquisite mosaics, and the remains of the Temple of Aphrodite. Fascinating catacombs, royal tombs, an ancient theatre and elegant villas with intact mosaics from millennia ago have also been excavated here. Paul the Apostle was said to have visited the town, and the pillar where he was supposed to have been tied to and whipped is visited by pilgrims every day. More recent monuments include Paphos Castle overlooking the harbour, and Ayios Neophytos Monastery, which has beautiful Byzantine frescoes and a cloister carved right into the mountain. Paphos’ picturesque fishing harbour attracts plenty of tourists. 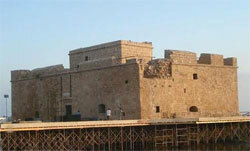 Kato Pafos, the site of the medieval port, is the main tourist area, offering plenty of entertainment. The quayside area is a lively place, with seafood restaurants and souvenir shops. The main shopping district of Paphos, however, is in the elegant uptown area which has lovely buildings in the classical style. Ktima is the primary residential area of Paphos. But perhaps the most attractive place to stay in Paphos is Aphrodite Hills, a new luxury resort development with a golf course, tennis courts, a gym, and a spa. Forbes Magazine recently named it one of the top five resorts in the world, and the best new resort. Apartments and townhouses are available nearby for sale or to let.